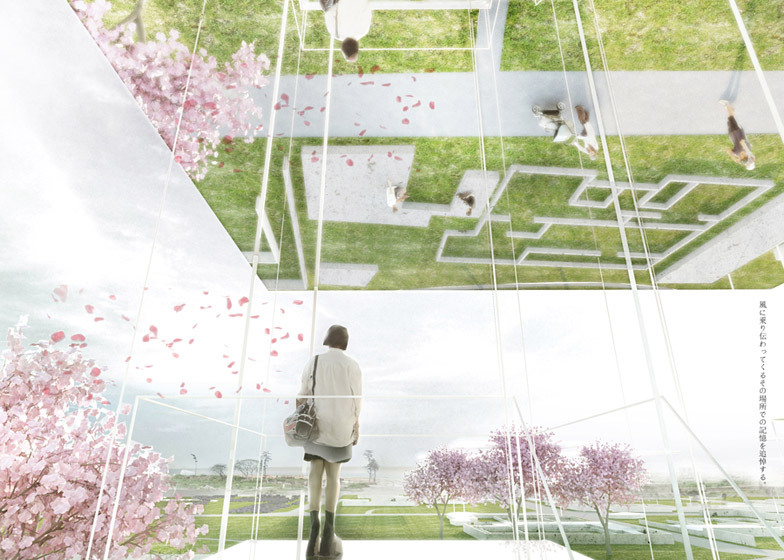 Graduate shows 2015: MIT graduate Beomki Lee has developed a proposal to commemorate the victims of the 2011 earthquake and tsunami in Sendai, Japan, with a series of spaces themed around air, earth, and water (+ slideshow). 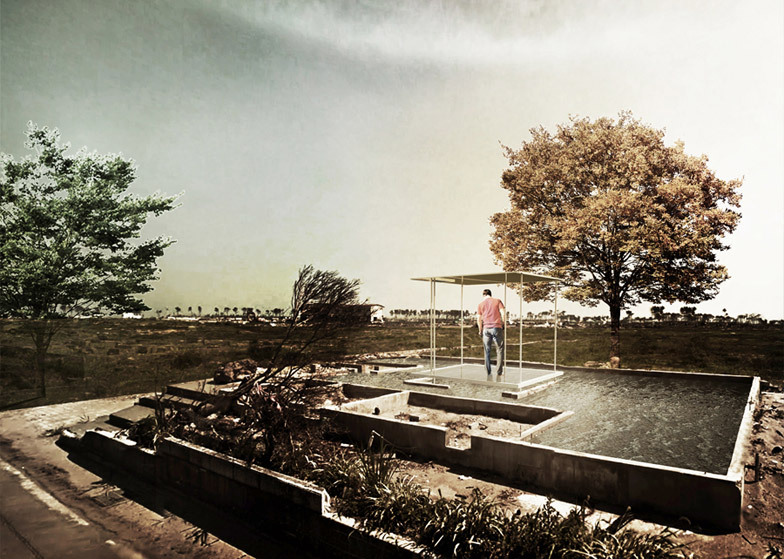 AirThe design proposes inserting different memorial types – based on the three elements – into a devastated area of Sendai's coastal landscape. The design proposes inserting different memorial types – based on the three elements – into a devastated area of Sendai's coastal landscape. On March 11, 2011, the Tōhoku earthquake and tsunami killed more than 10,000 people in Japan, with water travelling up to 10 kilometres inland in Sendai. This, and the resulting nuclear accident at the Fukushima power plant, forced millions from their homes. The suggested site for Lee's [ME]morial is now a designated revitalisation zone on the coast, which has been planned as a park and memorial area. Air"In spite of the fact that the earthquake and tsunami of 2011 left a trail of casualties, there have been only temporary memorial observances in Japan," said Lee, who completed the project as part of a masters degree at the Massachusetts Institute of Technology. "In spite of the fact that the earthquake and tsunami of 2011 left a trail of casualties, there have been only temporary memorial observances in Japan," said Lee, who completed the project as part of a masters degree at the Massachusetts Institute of Technology. His scheme treats the area as a found landscape with numerous sites of memory. The foundations of destroyed buildings would be used as locations for the three memorial types. Earth"Numerous foundations of the housing of the past remain, extending over several kilometres on the site," he explained. "These remnants become spots for offering individual memorial spaces." "Numerous foundations of the housing of the past remain, extending over several kilometres on the site," he explained. "These remnants become spots for offering individual memorial spaces." For Air, a thin frame forms an outline of a house and support a mirrored steel roof. A viewing platform would be suspended from the roof, offering views out over the devastated landscape. 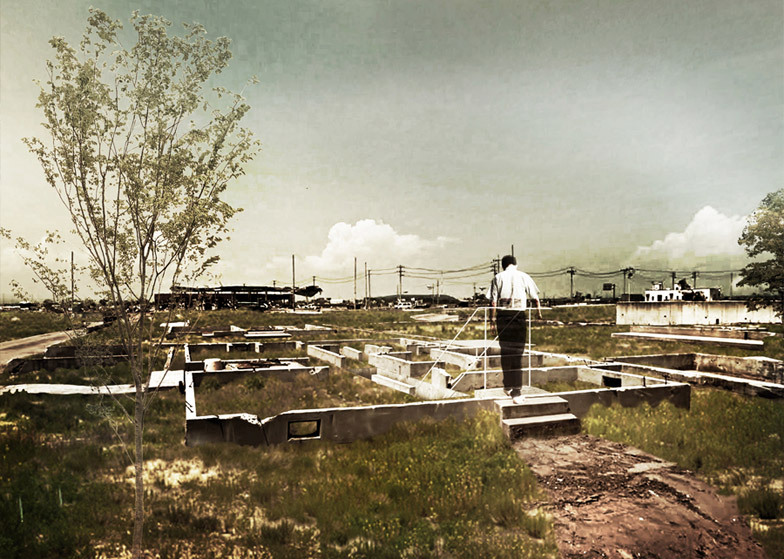 EarthEarth proposes an underground chamber made of concrete set within a ruined foundation. The small size of the chamber is meant to evoke a grave. Earth proposes an underground chamber made of concrete set within a ruined foundation. The small size of the chamber is meant to evoke a grave. 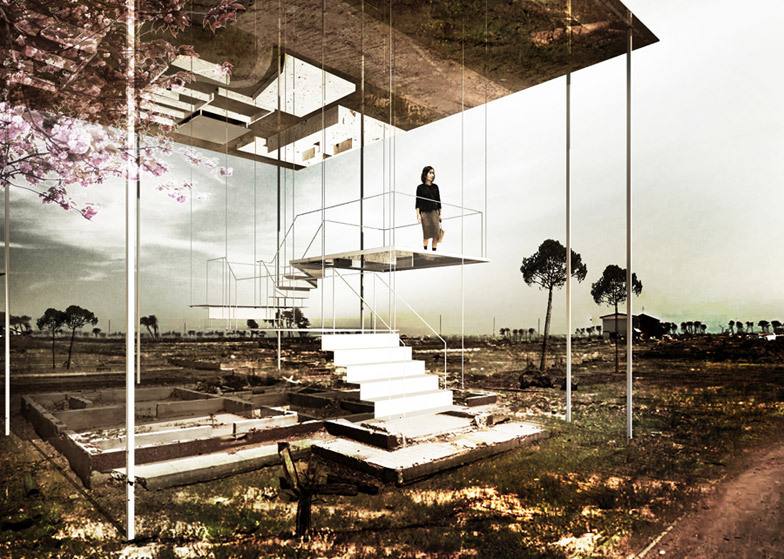 For Water, glass plates would be suspended over a reflecting pool set in the concrete base of a destroyed house. Visitors would look down into the water-filled volume. WaterHis [ME]morial designs aim to establish a more "reciprocal" relationship between individual memory and the collective imagination of the event by creating a landscape of small memorials, rather than a big focal sculpture or building. His [ME]morial designs aim to establish a more "reciprocal" relationship between individual memory and the collective imagination of the event by creating a landscape of small memorials, rather than a big focal sculpture or building. Most memorials privilege collective memory over that of solitary experience, creating a one-sided relationship between the memorial object and the viewer, according to Lee. "The project seeks to challenge and extend traditional architectural definitions of memorial architecture," said Lee. "Each individual will have personalised experiences in each [ME]morial. [ME]morial will serve as a space not only for soothing victims’ wounded hearts, but also for letting people memorialise their individual memories." WaterLee is not suggesting a set number or arrangement of the memorial types. They could be placed closely together or dispersed widely over the site. Determining the scope and configuration of the project could be conducted through a public process, which he says could itself become part of the collective healing for victims and the wider community. Lee is not suggesting a set number or arrangement of the memorial types. They could be placed closely together or dispersed widely over the site. Determining the scope and configuration of the project could be conducted through a public process, which he says could itself become part of the collective healing for victims and the wider community. Lee hopes that using the elements as the theme for the project, the memorials would prompt viewers to consider not only the loss of lives and the destruction wrought by the tsunami and earthquake, but also the unpredictability of the natural world. The scale of devastation caused by the earthquake and tsunami led to an outpouring of support from designers and architects, with projects including an inflatable concert hall designed by architect Arata Isozaki and artist Anish Kapoor and the launch of Toyo Ito's Home For All community rebuilding initiative.